For many people, the prospect of becoming anesthetized during an operation feels as uncomfortable as the surgical procedure itself. Then it is a good thing to remember that general anesthesia is very safe, and that Getinge’s machines are designed to provide excellent quality ventilation during anesthetic care. Anesthesia, the Greek word for ‘without sensation’, is essentially a medically induced comatose state, different from sleeping. It has been widely used since 1842, when Crawford Long administered diethyl ether to a patient and performed the first painless operation. The drugs that render the patient unresponsive, unconscious and unable to feel pain, are administered by an anesthesiologist or a certified registered nurse anesthetist, who also monitors the patient's vital signs and breathing. Overall, general anesthesia is very safe, even for particularly ill patients. However, there are still challenges, and Getinge’s development work focuses on finding solutions to them. Anesthesia starts with the induction, which involves putting the patient to sleep; in most cases by intravenous administration of pain relievers and hypnotic drugs. Once the patient is sleeping, the anesthesiologist controls the breathing by ventilating him or her by hand. If the planned surgery so requires, muscle relaxant drugs will stop all the patient’s will-driven motor activity. The airway is secured by inserting an endotracheal tube into the windpipe. The anesthesia machine’s ventilator takes over the patient’s breathing and begins to administrate the gas that keeps the patient asleep. While the surgery is performed, the anesthesiologist’s main focus is to monitor vital signs and adjust the mechanical ventilation, flow of anesthetic gas, the administration of drugs to the patient’s needs. “Our solutions focus on making anesthetists’ work situations less hectic. Automatic functions give them more time to focus on the patient. The aim is of course to contribute to better outcomes by helping to prevent complications during and after surgery,” says Mikael Petrini, Global Clinical Applications Manager at Getinge. 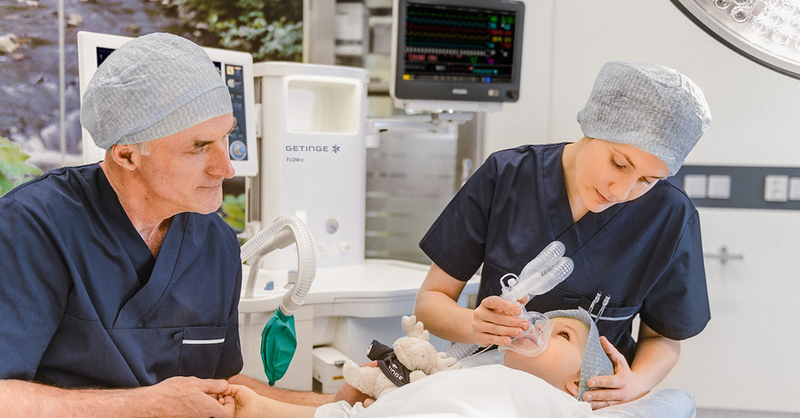 Getinge’s Flow-i anesthesia machine enables clinicians to continuously adapt and improve the procedure to the situation at hand while maintaining stable patient conditions. It is suitable for all types of patients; from neonates to very old or morbidly obese. Recently, Flow-i was accompanied by the compact Flow-c, soon to be followed by Flow-e, which has extended space for extra equipment. Getinge’s machines have several groundbreaking features, such as the automatic lung recruitment function that counteract atelectasis, a condition that means that the alveoli´s (small air sacs) have collapsed in parts of the lungs. This is a condition that 90% of all patients undergoing anesthesia gets, and it can lead to postoperative pulmonary complications. Another prominent feature is the Automatic Gas Control (AGC). 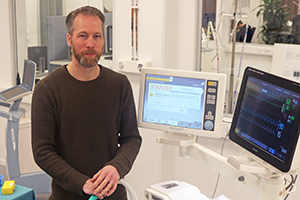 It provides clinicians with a ‘cruise-control’ that enables automatic and safe low flow anesthesia while reducing the risk of under- and overdosing the patient. By minimizing the waste of inhalational anesthetic agents, which contribute to global warming and affect the ozone layer, AGC also helps the anesthesiologist to be environmentally friendly. “The user experience is in sharp focus when we develop our anesthesia machines. This includes external features as well as the interface of all functions; including the most advanced, such as lung recruitment and AGC” concludes Mikael Petrini. Flow-e, the next addition to Getinge’s Flow anesthesia family, will be launched in 2019. Stay tuned!